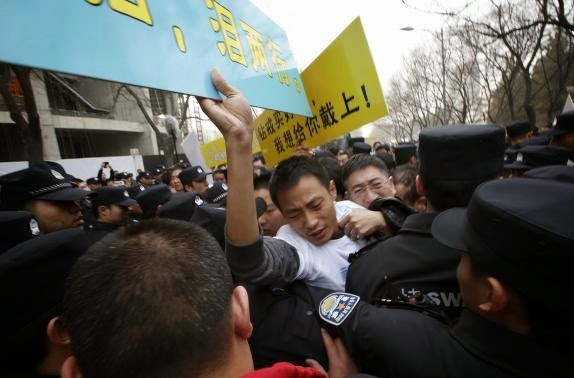 Dozens of angry relatives of passengers on a lost Malaysian jetliner clashed with police in Beijing on Tuesday, accusing the Southeast Asian country of "delays and deception" a day after it confirmed the plane crashed in remote seas off Australia. The relatives' grief and anger was unleashed on Monday night after Malaysian Prime Minister Najib Razak announced that Malaysia Airlines Flight MH370, which vanished more than two weeks ago while flying to Beijing from Kuala Lumpur, had crashed in the southern Indian Ocean. Citing satellite-data analysis by British firm Inmarsat, he said there was now no doubt that the Boeing jet came down in the ocean in one of the most remote places on Earth - an implicit admission that all 239 people on board had died. Bad weather in the region far off Australia's western coast on Tuesday forced the suspension of the search for any wreckage, just as a series of satellite images and other sightings of floating objects had raised hopes that debris from the plane would be found. Malaysia's confused initial response to the Boeing 777's disappearance and a perception of poor communications has enraged many relatives of the more than 150 Chinese passengers and strained ties between Beijing and Kuala Lumpur. After Najib's announcement, Chinese Deputy Foreign Minister Xie Hangsheng demanded Malaysia hand over all relevant satellite analysis showing how Malaysia had reached its conclusion about the fate of the jet. In a separate statement, Chinese Premier Li Keqiang said China would ask Malaysia to provide more detailed and accurate information on the plane, according to a government microblog account. Chinese President Xi Jinping will send a special envoy to Kuala Lumpur to consult with the Malaysian government, state news agency Xinhua said on Tuesday.